Even though it has a funny name which is hard to pronounce by men who want to seem tough, Pfister is one of the world’s largest faucet manufacturers. Their products are sold worldwide, and they are renowned for their long warranties and the top customer service they offer. 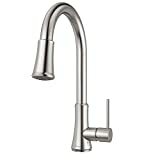 Pfister kitchen faucets are easy to install, and they use the latest technologies to provide excellent performances. Their faucets come in lots of different styles and designs, but no matter how they look, one thing is certain. Pfister faucets will get the job done. Whether you want a pull-down faucet or a normal one, you will buy a high-quality product if you choose Pfister. 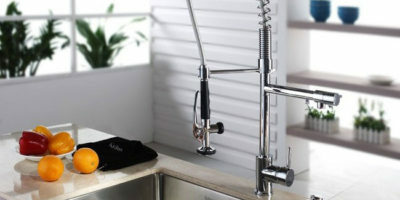 Read the following article if you want to find out the best Pfister faucet reviews of 2019. We’re certain that after reading our reviews, you will be able to find the right model for your home. The Pfister Pfirst is a high arc pullout faucet that is very effective. This is the type of faucet that will make a great addition to every kitchen because it will help with the chores and the cooking, but the faucet won’t turn any heads. This faucet has a simple yet effective design. The high arc spout will provide enough clearance so you can move around the faucet with ease, and it will allow you to wash large dishes even in shallow sinks. 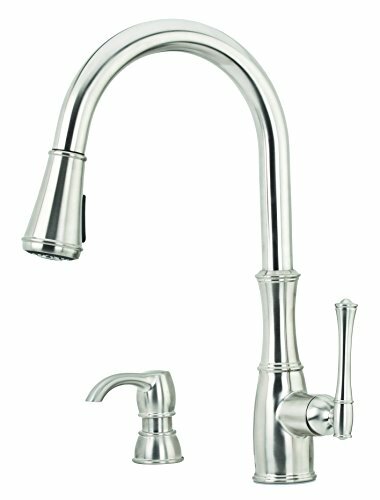 The Pfister Pfirst is a good faucet for people who want to get the job done and are looking for an efficient model. This faucet will blend in most kitchens, but it won’t look great in any of them. Spray Head Easy To Use – The pull-out spray head fits well in your hand and it has a rubberized tip to allow a better grip. Water Pressure Needs Adjusting – You will need to adjust the water pressure when you change the water spray pattern. The spray mode is very powerful, and switching to it without adjusting the water pressure will result in splashes. Conclusion: This faucet doesn’t look good. It actually looks ordinary, so it won’t attract attention. However, this is a highly efficient faucet, and it will definitely get the job done. 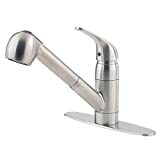 The Pfister Lita is an attractive faucet that uses with a pull-down spray head. 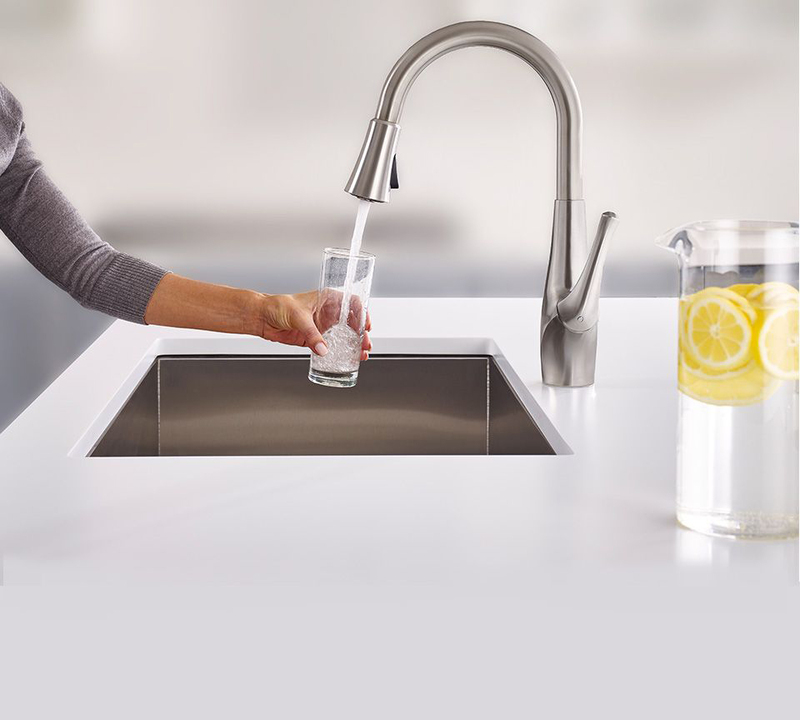 The faucet has a recyclable dual filter that’s capable of removing contaminants out of your drinking water for up to 6 months. This faucet is easy to install and it’s suitable for both a 3-hole and a 1-hole configuration. The water filter that comes with the faucet has to be installed in the space below the sink. The Pfister Lita is a great faucet that would make a nice addition to every kitchen, no matter its design. Filtered And Normal Water – The faucet is capable of producing both normal and filtered water, and changing between them is easy. You only have to push the handle back and you get filtered water instead of unfiltered one. Deck Plate Sold Separately – Even though this faucet looks better when it’s installed on a deck plate, one is not included in the package and has to be bought separately. 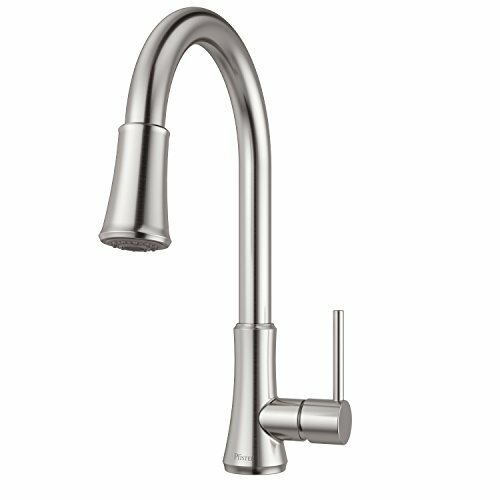 Conclusion: The Pfister Lita is a nice looking faucet that will make a great addition to every kitchen. The faucet looks better with a deck plate, but you have to buy one separately. The Pfister Wheaton is a high arc pulldown faucet that comes in nice finishes. The faucet is compatible with 1 or 3-hole configurations, and it will look great on most sinks currently available on the market. With a high arc spout and a classic design, this faucet will look amazing in traditionally designed kitchens. This faucet not only looks good, but it will help you in the kitchen. The pull-down sprayer will help clean up large pots and pans, and the stream mode will help with removing difficult stains. Pause Mode Seems Useless – The sprayer comes with a pause mode. However, this mode will most likely not be used frequently. Conclusion: The Pfister Wheaton looks great and it works great too. In fact, the faucet looks like a luxury faucet but it costs only a fraction of what a luxury one would. The Pfister Pfirst is a high arc pulldown faucet that comes with a decorative deck plate for a better fit in your kitchen. The faucet has nice finishes that will match your other fixtures and appliances, so it will blend in nicely in your kitchen, no matter its design. This faucet has a forward handle operation, so it’s suitable for a backsplash application. This feature allows you to install the faucet close to a wall because you won’t need to reach behind the handle. 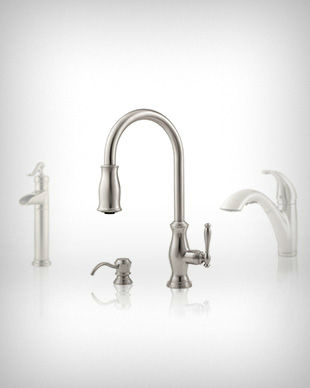 The Pfister Pfirst is a good looking faucet that will fit right in most modern kitchens. The faucet can be installed in a traditional kitchen, but it might seem out of place. High Arc Spout – The high arc spout will give you more room to move around the faucet. This will come in handy when you clean dishes, especially if you don’t like using the pull-down feature. Pull-Down Nozzle Has To Be Adjusted – The pull-down sprayer won’t slide in effortlessly into the spout, it will need some guidance every time you use it. Conclusion: The Pfister Pfirst is a good looking faucet that will help you in the kitchen, but not without fouls. The spray head could be better, so you might want to take a closer look at the Pfister Lita and the Pfister Wheaton if you like using the sprayer often. Pfister was originally founded in 1910 by William Pfister and Emil Price and was initially called Price Pfister. When it first started, the company sold garden faucets, but after a decade they branched out their production to kitchen and bathroom faucets, as well. When they branched out, the company also decided to produce miscellaneous plumbing articles, such as hoses, valves, and soap dishes. In the following ten years, the company invented and patented a lot of products, but then World War II started. Like so many other American companies, Pfister took a break from producing their products and helped with the war effort instead. The company’s breakthrough came in the 1950s when they produced the Crown Jewel line. This faucet line quickly became popular because it was easy to install and more durable than the competition’s products. Another breakthrough came in the 90s when the company produced the first affordable pull-out faucets. 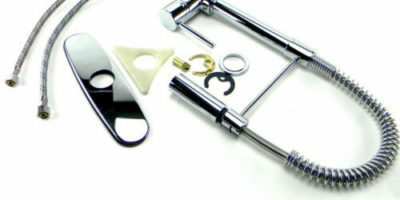 Since then, the company continued innovating and producing high-quality products. Pfister is now world-renowned for their long warranty periods and the good customer service. 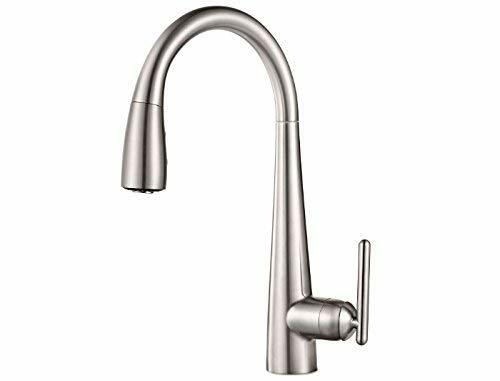 Read more about kitchen faucet reviews! Pfister is one of the most famous faucet manufacturers in the world, and after reading our Pfister faucet reviews, we’re certain you’ll understand why. Their faucets use the latest technologies to provide a good performance, and most of them are backed by a limited lifetime warranty. Pfister faucets are not only effective, most of them also look great. Installing a faucet developed by this company is a piece of cake, and most people will be able to do it themselves without encountering any problems. When you decide to buy a Pfister faucet, you’re buying a product backed by more than a century of experience. If you’re wondering how a company can last for more than a century producing faucets, the answer is simple. It kept implementing new technologies in their products, staying in front of their competition. When you buy Pfister, this is what you’re buying. A product using new technologies that will last for a long time.